This compendium of 29 chapters from 18 countries contains both fundamental and advanced insight into the inevitable shift from cities dominated by the fossil-fuel systems of the industrial age to a renewable-energy based urban development framework. The cross-disciplinary handbook covers a range of diverse yet relevant topics, including: carbon emissions policy and practice; the role of embodied energy; urban thermal performance planning; building efficiency services; energy poverty alleviation efforts; renewable community support networks; aspects of household level bio-fuel markets; urban renewable energy legislation, programs and incentives; innovations in individual transport systems; global urban mobility trends; implications of intelligent energy networks and distributed energy supply and storage; and the case for new regional monetary systems and lifestyles. Presented are practical and principled aspects of technology, economics, design, culture and society, presenting perspectives that are both local and international in scope and relevance. Architects, urban planners and policy makers; energy experts and efficiency planners; state and local government leaders and officials; renewable energy systems planners; municipal energy experts and leaders; government agencies; renewable energy industry leaders and policy makers; political leaders. Researchers and lecturers in architecture, building and architectural design science and engineering; urban ecologists and environmental engineers; energy engineers and scientists; academic staff in urban and regional planning, infrastructure planning, urban history, theory and criticism. Peter Droege directs the Liechtenstein Institute for Strategic Development, the global advisory and research organization for the rapid transition to regenerative communities, cities, regions and infrastructure. Professor Droege serves also as President of Eurosolar, the European Association for Renewable Energy, and as General Chairman, World Council for Renewable Energy. A recipient of the European Solar Prize in Education, Peter Droege initiated the Chair for Sustainable Spatial Development at the University of Liechtenstein while holding a Conjoint Professorship at the Faculty of Engineering, School of Architecure and the Built Environment, University of Newcastle, Australia. An inaugural member of the Zayed Future Energy Prize jury and Expert Commissioner for Cities and Climate Change for the World Future Council he also served on the Steering Committee of the Urban Climate Change Research Network hosted at Columbia University's Goddard Institute for Space Studies and CUNY. He has taught and researched at the Massachusetts Institute of Technology's School of Architecture and Planning, at Tokyo University as Endowed Chair in Urban Engineering at the Research Center for Advanced Science and Technology, and as Lend Lease Chair of Urban Design at the University of Sydney. Professor Droege has authored or edited numerous books, including Intelligent Environments (Elsevier 1997), Urban Energy Transition, 1st Edition: From Fossil Fuels to Renewable Power (Elsevier 2008), The Renewable City (Wiley 2006), 100% Renewable - Energy Autonomy in Action (Earthscan 2009 and Routledge 2014), Climate Design (ORO Editions 2010), Regenerative Region: Lake Constance Energy and Climate Atlas (oekom verlag 2014), co-editing Regenerative Räume (oekom verlag 2017). 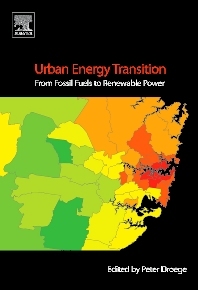 This a fresh and sweeping, rigorously scientific and yet extraordinarily applied and practical look at a rising global phenomenon: renewable energy for cities and regions. Beautifully illustrated in full colour, this instills great optimism for this rapidly urbanizing planet, still all too dependent of fossil fuel, and therefore precariously slipping towards climate calamity. Each of the meticulously selected papers, almost three dozen of them, offers an important insight into a crucial domain-but it is equally interesting and useful to have at hand a veritable library, a comprehensive handbook sstructured into four fascinating areas: finance, governance, technology and design.